I am officially becoming the Queen of One Skillet Meals. 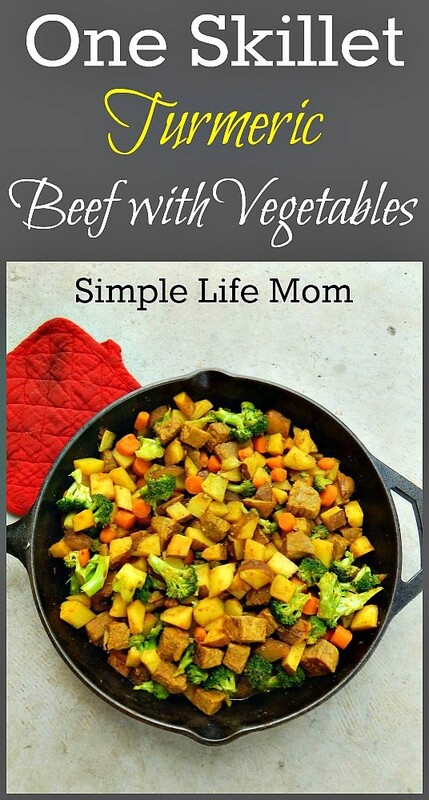 Yes, that is a self assigned title, but I just love the simplicity of throwing things into one skillet. Why? Speed, less work, and less cleanup! 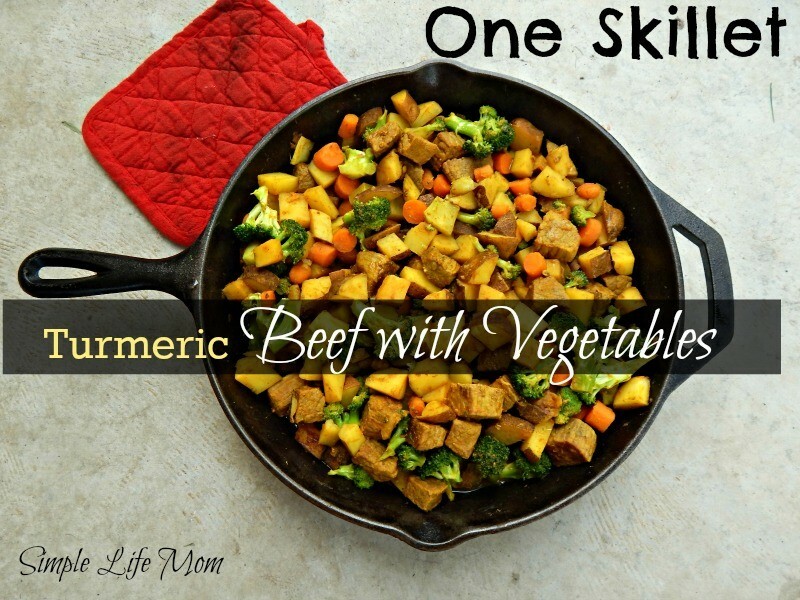 This One Skillet Turmeric Beef with Vegetables is an easy family favorite. Easy for me, favorite for everyone. Not to mention that it has some wonderful health benefits derived from the main ingredients, as well as the spices used in this recipe. I like to give options. This recipe is super simple, but the flavors are complex. You can make the recipe as is, but don’t be afraid to add your own favorite spice blends. Add some spice: a good siranche sauce, pepper flakes, chipotle powder. Use other veggies. Use what you have on hand, add some shredded cabbage at the last minute, try some zucchini or cauliflower. You can also try adding my Homemade Onion Soup Mix. Make this recipe ahead of time so you can have it on hand for soup, dips, or recipes like these (great on potatoes!). Turmeric is a wonderful root that we are learning more and more about. The bandwagon tells us to take curcumin pills with black pepper on a regular basis. While this is more similar to the type of amounts used in the tests against cancer, it also removes the curcumin from other very important aspects of the root. Eating turmeric means you will be getting a smaller amount of the curcumin in your diet, but it also means that you will be getting the benefits of the volatile oils, proteins and resin that works together to help your body more readily absorb and use the curcumin. Thyme is another ingredient that is very good for the body. It increases circulation and is a gentle diuretic, helping you rid your body of toxins. It is also traditionally used for any respiratory illnesses. Why do herbs work in so many ways? Simple. They help to build up your body so it can do what it was designed to do. Herbs aren’t a pill for this or that, they apply to the whole body, which is why you will see a list that an herb may help with a large number of things. One Skillet for a fast, easy meal full of flavor. Add coconut oil to large skillet over medium heat. Add Beef, onions, and potatoes and begin to brown. Add more oil if necessary. Once meat is cooked and potatoes begin to soften, lower temperature to low, add remaining ingredients and cover. Check and stir every 5 minutes, until carrots and potatoes or tender. Shared on some of these great blogs. Thank you for sharing too! Turmeric and Thyme sound like an amazing combo! I am with you on the whole one skillet meal thing. I have been wanting to make more of these myself. They are such a time saver! Love your new recipe, I am going to print it out right now! I made this tonight for supper. It was well received and is a keeper to be made again. The turmeric is what caught my attention. My husband has three forms of arthritis and I’ve heard that Turmeric is good for arthritis so, now he and our older dog are getting it! Thank you. Thanks so much for sharing this delicious skillet full of goodness with us. Have a great week and hope to see you at Full Plate Thursday again real soon!